If you or a loved one is arrested on the way home from the yacht club, or for driving your motorboat through San Diego bay, then it is crucial to find the best attorney to advocate on your behalf. Call Mark L. Deniz Esq., an effective and competent DUI and criminal defense attorney to represent you in court. Call 858-429-9982 as soon as possible. The Law Office of Mark Deniz is dedicated to DUI. The firm is proud to work with efficiency and discretion. Point Loma DUI defense attorney Mark Deniz provides high quality and affordable DUI-Drunk Driving defense representation. Mr. Deniz defends persons accused of DUI-Drunk Driving in all San Diego county. DUI Attorney Mark Deniz meets with each potential client in person and personally represents each client in court and at the Department of Motor Vehicles. Point Loma DUI attorney Mark Deniz can meet conveniently throughout the county to serve the needs of his clients. If you were arrested in Point Loma you will likely have to appear downtown. If you live in Point Loma, attorney Mark Deniz can appear downtown at court for you. The court location can be found in the Resource section. More than 200 years were to pass before a permanent European settlement was established in San Diego in 1769. Mission San Diego itself was in the San Diego River valley, but its port was a bayside beach in Point Loma called La Playa (Spanish for beach). 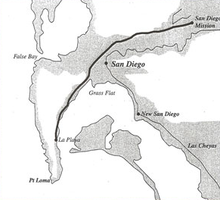 The historic La Playa Trail, the oldest European trail on the West Coast,  led from the Mission and Presidio to La Playa, where ships anchored and unloaded their cargoes via small boats. Part of the route became present-day Rosecrans Street. In his book Two Years Before the Mast, Richard Henry Dana, Jr. describes how sailors in the 1830s camped on the beach at La Playa, accumulated cattle hides for export, and hunted for wood and jackrabbits in the hills of Point Loma. The beach at La Playa continued to serve as San Diego's "port" until the establishment of New Town (current downtown) in the 1870s. Ballast Point got its name from the practice of ships discarding their ballast there on arriving in San Diego Bay and taking on ballast as they left for the open ocean. Fort Guijarros was constructed at Ballast Point in 1797. Ballast Point and La Playa are now on the grounds of Naval Base Point Loma. The Greek theatre the Theosophistsbuilt in 1901. See also: List of San Diego Historic Landmarks in the Point Loma and Ocean Beach areas Another view of "Old Point Loma Lighthouse"
The top of the peninsula is fairly flat, reaches an elevation of 422 ft (129 m),  and is capped by much younger sandstone and conglomerate deposits from the Pleistocene era, 1 million years or less in age. These flat-lying beds lie directly on top of the gently dipping Point Loma and Cabrillo formations. The gap in the sedimentary record, called an Angular unconformity, represents about 70 million years of non-deposition and/or erosion. Connected to Point Loma Village by a causeway is Shelter Island, which is actually not an island but a former sandbank in San Diego Bay. Shelter Island was developed in the 1950s after it was built up into dry land using material dredged from the bay. It is under the control of the Port of San Diego and contains hotels, restaurants, marinas, and public parkland. The bayside hills between Rosecrans Street and Chatsworth Boulevard north of Nimitz Boulevard are known as Loma Portal. A distinctive feature of this neighborhood is the location of street lights in the middle of several street intersections instead of on the sidewalk. Loma Portal lies directly in the takeoff pattern for planes from Lindbergh Field, making it the home of the "Point Loma Pause" where all conversation ceases temporarily due to airplane noise. The east-west streets in Roseville and Loma Portal are known as the "alphabetical author streets". The streets are named for authors in alphabetical order from Addison to Zola, with a second partial cycle from Alcott to Lytton. The northwest corner of the peninsula, where the San Diego River flows into the ocean, is a separate community known as Ocean Beach. The southern one-third of the Point Loma Peninsula is entirely federal land, including Naval Base Point Loma, Fort Rosecrans National Cemetery, and Cabrillo National Monument. Marine activities are mostly located on the Bay side of the peninsula, where there are three yacht clubs, including the San Diego Yacht Club which was home to the America's Cup from 1988 to 1995. There are several small-boat marinas and a commercial sport fishing dock on the Bay side. There are other businesses related to yachting and fishing, such as marine supply stores, yacht brokerages, boat repair yards, and hotels and motels catering to fishing enthusiasts. Some restaurants and hotels have docks for customers who arrive by boat. The Point Loma area has a number of hotels, restaurants, and local businesses. Located in the Voltaire business district, near Ocean Beach, is the Point Loma Youth Hostel, frequented by travelers from around the world. The San Diego Sports Arena and the SOMA concert venue are located in the Midway neighborhood of Point Loma. Naval Base Point Loma, at the southern end of Rosecrans Street in the La Playa area, is the home of Submarine Squadron 11, with several nuclear fast-attack submarines, and the Naval Mine and Anti-Submarine Warfare Command, including eight Avenger class mine countermeasures ships. The naval base also houses extensive electronic and communications operations (including the former Naval Electronics Laboratory) serving the Pacific Fleet. At the southern end of the peninsula is historic Fort Rosecrans, site of the U.S. Army's Coast Artillery Corps during World War I and World War II. Fort Rosecrans also includes the Fort Rosecrans National Cemetery and the USS Bennington Monument. Point Loma contains a few small neighborhood parks and the Cabrillo Recreation Center. There is large waterfront park at Liberty Station, which also contains a nine-hole golf course. 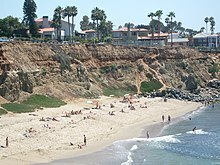 Most of the ocean frontage of the peninsula is a public shoreline park called Sunset Cliffs Natural Park. The Point Loma Native Plant Garden features plants and flowers native to the San Diego area. Cabrillo National Monument is a federal historic park at the southern end of the peninsula. The Point Loma community is part of the city of San Diego. On the San Diego City Council it is part of District 2, currently represented by Lorie Zapf. In the Government of San Diego County, Point Loma is divided between District 1 and District 4. In the California state legislature it is part of Assembly District 78, currently represented by Assemblymember Toni Atkins, and Senate District 39, represented by Senator Marty Block. At the federal level it is part of the 52nd Congressional District and is represented by Congressman Scott Peters. The Peninsula Community Planning Board is an advisory board which makes recommendations to the city on planning, land use, and similar matters for the Point Loma area. There are separate planning boards for Ocean Beach and the Midway area. Point Loma has several public, charter, and private schools at the elementary, middle, and high school levels, as well as multiple private preschools, an adult school and a university. Point Loma's public schools are part of the San Diego Unified School District. Neighborhood public schools include Point Loma High School, two middle schools, and seven elementary schools. There is also a public charter school campus in the Liberty Station area which encompasses three high schools, two middle schools, and one elementary school, collectively known as High Tech High. Point Loma educational facilities also include a K-12 religious school, a religious elementary/middle school, and a private elementary/middle school. Post-secondary education is offered at Point Loma Nazarene University, a Christian liberal arts college whose ocean-view campus was once the home of the Theosophical Society. The Peninsula also has a branch campus of the San Diego Community College District. Jump up^ "2010 Census Population for ZIP Code 92107". Zip-codes.com. Retrieved 5 January 2013. Jump up^ "2010 Census Population for ZIP Code 92106". Zip-codes.com. Retrieved 5 January 2013. ^ Jump up to: a b c d e f g h i j k l m n "Peninsula Community Plan". City of San Diego. Retrieved30 January 2013. Jump up^ Scott, Byron N. "Old La Playa Trail Becomes Modern 4-Lane Divided Highway". California Highways and Public Works. Vol. 18, no.7. July 1940. p. 10. Jump up^ Pourade, Richard F. "Chapter 14: Richard Henry Dana". The History of San Diego. San Diego History Center. Retrieved 29 January 2013. Jump up^ Ruhlen, George. "Historic California Posts - Fort Rosecrans (Including Castillo de Guijarros and Point Loma Military Reservation)". MilitaryMuseum.org (The California State Military Museum). Retrieved 2008-03-02. Jump up^ "Historic California Posts: Fort Rosecrans". California State Military Museum. Retrieved26 October 2012. Jump up^ "Naval Training Center, San Diego". California State Military Department. Retrieved26 October 2012. Jump up^ Ruhlen, George (October 1959). "Fort Rosecrans, California". The Journal of San Diego History 5 (4). ^ Jump up to: a b c Harris, Iverson L. (Summer 1974). "Reminiscences of Lomaland: Madame Tingley and the Theosphical Institute in San Diego". The Journal of San Diego History (San Diego History Center) 20 (3). Jump up^ Kirkley, Evelyn A. (Winter 1997). ""Starved and Treated Like Convicts": Images of Women in Point Loma Theosophy". The Journal of San Diego History (San Diego History Center) 43 (1). ^ Jump up to: a b Engstrand, Iris Wilson (2005). San Diego: California's Cornerstone . San Diego: Sunbelt Publications. pp. 119-120. ISBN 978-0-932653-72-7. Jump up^ "Charles Lindbergh Dutch Flats Plaque At The San Diego Post Office Location 23 Aug 2007". WorldWide Pucks production. August 23, 2007. Retrieved 5 January 2013. Jump up^ "The abandoned lighthouse". The Old Point Loma Lighthouse. Cabrillo National Monument. Retrieved 29 January 2013. Jump up^ "The Old Point Loma Lighthouse". Cabrillo National Monument. National Park Service. Retrieved 13 December 2012. Jump up^ "Old Point Loma Lighthouse - San Diego, CA". waymarking.com. Retrieved 31 January2013. Jump up^ "Rosecroft - San Diego, California". waymarking.com. Retrieved 31 January 2013. Jump up^ "Paleontological Resources". Draft General Plan. City of San Diego Planning Department. September 2007. pp. 3-11.5. Retrieved 29 January 2013. 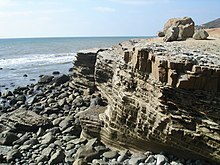 Jump up^ "Cabrillo Formation". Local Geology:Southern California and Mexico. Department of Geological Sciences, San Diego State University. Retrieved 29 January 2013. Jump up^ "Environmental factors". Cabrillo National Monument. National Park Service. Retrieved6 January 2013. Jump up^ Fetzer, Leland (2005). San Diego County Place Names A to Z . Sunbelt Publications. p. 133. ISBN 978-0-932653-73-4. Jump up^ Fetzer, Leland (2005). San Diego County Place Names A to Z . Sunbelt Publications. p. 123. ISBN 978-0-932653-73-4. Jump up^ Stern, Norton B.; Kramer, William M. (Fall 1973). "The Rose of San Diego". Journal of San Diego History 19 (4). Jump up^ "REPORT NO. HRB-09-018". Historical Resources Board. City of San Diego. March 13, 2009. Retrieved 31 January 2013. Jump up^ Walsh, Patricia M. (2008). "It's time for a different kind of Pt. Loma pause". San Diego Community Newspaper Group. Retrieved 31 January 2013. Jump up^ Lydy, Donald. "Point Loma Ecological Reserve". SPAWAR. U.S. Navy. Retrieved29 January 2013. Jump up^ "Mammals". Cabrillo National Monument. National Park Service. Retrieved 29 January 2013. Jump up^ "Birds". Cabrillo National Monument. National Park Service. Retrieved 29 January 2013. Jump up^ Shroder, Susan (December 3, 2008). "Woman who died in cliff fall mourned". San Diego Union Tribune. Retrieved 29 January 2013. Jump up^ Payton, Mari (April 13, 2009). "Two Men Fall From Sunset Cliffs". NBC 7 San Diego. Retrieved 29 January 2013. Jump up^ "Lifeguards Rescue Woman After Fall at Sunset Cliffs". KFMB-TV. May 3, 2009. Retrieved29 January 2013. Jump up^ "Major Tenant Commands". Naval Base Point Loma. Retrieved 31 January 2013. Jump up^ "Photo Galleries: Festa May 31 09". San Diego Union Tribune. May 31, 2009. Retrieved29 January 2013. Jump up^ Varga, George (March 29, 2009). "Small Wonders". San Diego Union Tribune. Retrieved29 January 2013. Jump up^ "Homes will be aglow for holiday tours". San Diego Union-Tribune. November 28, 2004. Retrieved 13 February 2014. Jump up^ Gentile, Anthony. "'GRAND DAME' OF HOME TOURS". San Diego Community Newspaper Group. Retrieved 13 February 2014. Jump up^ "All Souls' Celebrates 60 years of Home Tours". Presidio Sentinel. November 2, 2012. Retrieved 13 February 2014. Jump up^ Heilbrunn, Sharon A. (December 20, 2008). "For many at Christmas, let there be lights". San Diego Union-Tribune. Retrieved 29 January 2013. Jump up^ "San Diego Bay Parade of Lights website". Retrieved 30 January 2013. Jump up^ "San Diego's Best: Branch library". San Diego Magazine. June 2006. p. 106. Retrieved21 March 2013. Jump up^ "Point Loma". City Council District 2. City of San Diego. Retrieved 1 February 2013. Jump up^ "Peninsula Community Planning Board website". Retrieved 29 January 2013. Jump up^ "Point Loma Cluster website". San Diego Unified School District. Jump up^ "High Tech High website". Retrieved 30 January 2013.